Dentures are removable replacements for missing teeth. Although when they were first made they take a little getting used to and didn’t feel like your natural teeth, today’s dentures are more natural-looking and feel more comfortable. There are full dentures and partial dentures. Your dentist can help you decide which dentures will suit you best based on how many teeth need to be replaced and the costs involved. With full dentures, a flesh-coloured acrylic base will be fit over your gums while the base of the upper denture will cover the roof of your mouth. A conventional full denture is placed in your mouth after any remaining teeth are removed and the tissues have healed, which may take several months, during which you are without teeth. Immediate full dentures, which were made prior to your visit, are inserted immediately after the remaining teeth are removed. 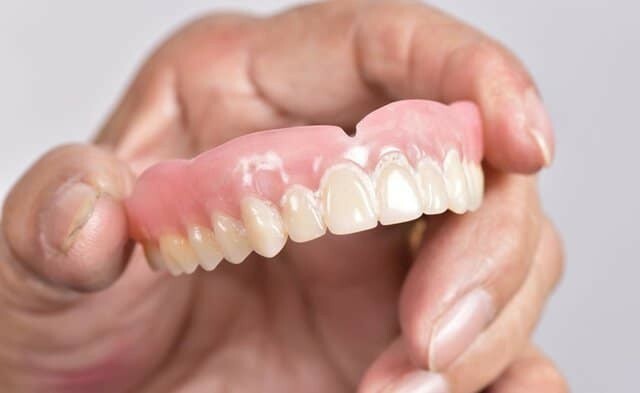 These dentures provide the benefit of never having to be without teeth but the one downside is that they must be reclined several months after insertion due to bone support reshaping during the healing process. It may cause your denture to become loose. A partial denture will rest on a metal framework that attaches to your natural teeth. Sometimes crowns are placed on some of your natural teeth and act as an anchor for the dentures. These can offer a removable alternative to bridges. At first, new dentures may feel awkward or uncomfortable for the first few weeks or months. Eating and speaking with them in may take a little practice and getting used to as they can feel bulky or loose while your cheek and tongue muscles learn to hold your dentures in place. There may also be symptoms of excessive saliva, feeling like the tongue has no room and minor irritation or soreness. Over time, your denture will need to be reclined, remade or rebased due to normal wear. Rebasing means making a new base while keeping the existing denture teeth. Your mouth changes as you age, which can cause your dentures to loosen, making chewing difficult and irritating. Be sure to see your dentist annually for a checkup. 1. When handling your dentures, stand over a folded towel or basin of water as dentures are delicate and may break if they’re dropped. 2. Don’t let them dry out. Keep them in a denture cleanser soaking solution or in plain water when you’re not wearing them. Never use hot water because they can cause warping. 3. Brushing your dentures daily to remove food deposits and plaque can help prevent stains. Although an ultrasonic cleaner may be used to care for your dentures, it does not replace brushing daily. 4. Brush your gums, tongue, and palate every morning with a soft-bristled brush before you insert your dentures. By doing this, you are stimulating circulation in your tissues and helps remove plaque. See your dentist if your dentures break, chip, crack or become loose. Don’t be tempted to adjust them yourself, as this can damage them beyond repair. Tee Family Dental is a local dental office in Perth that can help with the denture installation process – get in touch today to see how we can help.